Financial planning is one of the most sensitive issues that every individual has to deal with. For a happy and rewarding life, every one of us is expected to manage finances in such a manner that makes them fully prepared for any discrepancies in the near future, ailments, old age and events that are beyond our control. Despite being aware of the importance of financial planning, most Americans fail to even plan for their immediate future. It may be shocking to read but 15.7% of the Americans do not have a healthcare cover to protect them from the financial burden when they have to deal with some disease or medical condition in the future. Here is something that is even more shocking. 95 million American adults do not have life insurance. Americans are not saving enough funds for their retirement. Nearly 150 million Americans have literally no funds for their retirement or old age. Despite being advised repeatedly by financial pundits to save a fixed proportion of their income, over 33% of the adults spend more than they can afford, leaving no room for any savings. 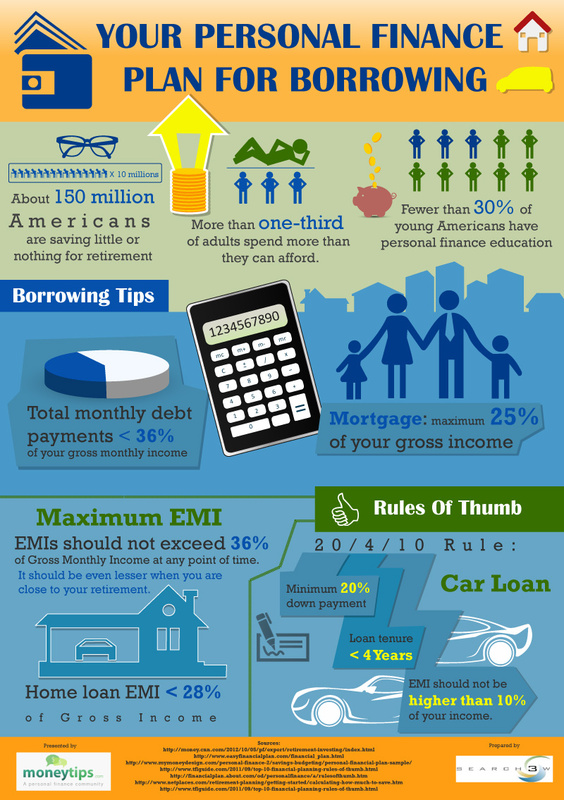 In addition, less than 30% of young Americans have personal finance education. Without proper savings, the personal finance loan can become a burden on the individuals. Your total monthly debt payments should not be more than 36% of your gross monthly income. Maximum EMI should not be more than 36% of gross monthly income. In case you are nearing your retirement, the EMI should be even lower so that you can save for the retirement. In case of home loan, the EMI should not exceed 28% of the total gross income at any point of time. When you are planning to take a loan for buying a car, always ensure that you make 20% of the down payment at least. In addition, a car loan should never be more than 4 years and the EMI should not be higher than 10% of your total income. Managing finances is very important to ensure that your daily needs are met without any hardship. Keep these tips in mind and ensure proper management of your finances. 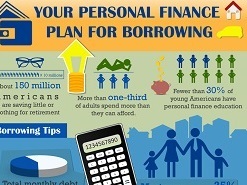 We beleive this infographic will help you when borrowing money.